Chive, generally used in the plural as chives, is the common name for a bulbous, fragrant, herbaceous plant, Allium schoenoprasum, which is characterized by slender, hollow leaves and clusters of lavender flowers. The term chives also refers more specifically to the edible leaves of this plant, which are used as a popular seasoning. Because the plants grows in clumps, rather than as individual plants, typically the term "chives" is used rather than "chive," although various references also use chive as the main entry. 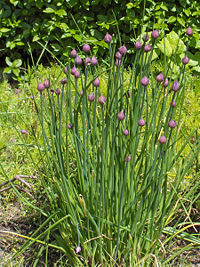 Chives are used as common culinary herbs to provide a mild onion flavor, with the leaves used fresh or dried. The colorful and edible flowers also may be added for salads. In addition, chives are cultivated for their ornamental value, such as used in dry bouquets or in flower gardens, and traditionally have been used for medicinal value. 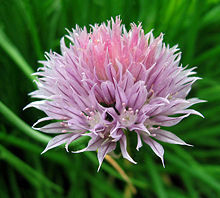 The unique appearance, taste, smell, and texture of chives offer a unique joy to humans, beyond the mere nutritional or other utilitarian value of the herb. Chive is the smallest species of the onion family, Alliaceae (LaFray 1987; Trowbridge 2006). Alliaceae is a taxa of herbaceous perennial flowering plants. They are monocots and part of order Asparagales. 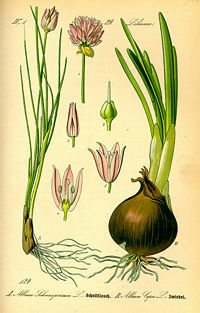 The family has been widely, but not universally, recognized; in the past, the plants involved, including chives, were often treated as belonging to the family Liliaceae, and still are by some botanists. The chive is a bulb-forming herbaceous perennial plant, growing to 30-50 centimeters (cm) tall. The bulbs are slender, conical, 2-3 cm long and 1 cm broad, and grow in dense clusters from the roots. Unlike regular onions, there is no large bulb formed underground, and the leaves are the source of the onion flavor (Trowbridge 2006). The leaves are hollow, tubular, up to 50 cm long, and 2-3 mm in diameter, with a soft texture, although, prior to the emergence of a flower from a leaf, it may appear stiffer than usual. The flowers are pale purple, star-shaped with six tepals, 1-2 cm wide, and produced in a dense inflorescence of 10-30 together; before opening, the inflorescence is surrounded by a papery bract. The seeds are produced in a small three-valved capsule, maturing in summer. The herb flowers from April to May in the southern parts of its habitat zones and in June in the northern parts, such as Sweden (Kemper 2008; Naturhistoriska Riksmuseet 1997). Close-up of a chive flower. Chives are the only species of Allium native to both the Old World and New World. Sometimes, the plants found in North America are classified as A. schoenoprasum var. sibiricum, although this is disputed. Among the American chives significant local differences have been noted: one example was found in northern Maine growing solitary, instead of in clumps, and exhibiting dingy gray flowers (McGary 2001). The chive species name derives from the Greek skhoinos (sedge) and prason (onion) (Naturhistoriska Riksmuseet, 1997). Its English name, chive, derives from the French word cive, which was derived from cepa, the Latin word for onion (Trowbridge 2006). Chives have been cultivated in Europe since the Middle Ages, although signs of its usage date back to 5,000 years ago (Trowbridge 2006). Chives thrive in well drained soil, rich in organic matter, with a pH of 6-7 and full sun (Kemper 2008). Chives can be grown from seed and mature in summer, or early the following spring. Typically, chives need to be germinated at a temperature of 15°C to 20°C and kept moist. They can also be planted under a cloche or germinated indoors in cooler climates, then planted out later. After at least four weeks, the young shoots should be ready to be planted out. In the winter, chives die back to the underground bulbs, with the new leaves appearing in early spring. Chives starting to look old can be cut back to about 2-5 cm; this length is also preferred when harvesting, making the unattractive yellowing appear close to the ground, so that the plant can retain its aesthetic value. Scallions are often mistaken for chives. In this photo, chives (green onion) serve as a garnish for Japanese soup misoshiru. Chives are a common household herb, frequent in gardens as well as in grocery stores. Chives are grown for their leaves, which are used for culinary purposes as a condiment, which provide a somewhat milder onion flavor than other Allium species. Culinary uses for chives include shredding the leaves (straws) for use as condiment for fish, potatoes and soups. Chives may be purchased fresh or frozen and freeze-dried. Chives can be found fresh at most markets year-round, making it a readily available spice herb. Fresh leaves can be stored in a plastic bag for up to a week in a refrigerator (Herbst 2001). Chives can also be dry-frozen without much impairment to their taste, giving home growers the opportunity to store large quantities harvested from their own garden (Trowbridge 2006). In order to retain flavor, leaves should be added near the end of the cooking time (Herbst 2001). Fresh chives are a good source of vitamin A and provide a fair amount of potassium and calcium (Herbst 2001). They also are rich in vitamin C and contain trace amounts of sulfur and iron (Gilbert 2006). The dried leaves are used as a herb as well. Furthermore, the edible flowers are used to make a colorful garnish. Chives are used for a wide variety of culinary purposes, such as in traditional dishes in France and Sweden, among others. In his 1806 book, Attempt at a Flora (Försök til en flora), Retzius describes how chives are used with pancakes, soups, fish, and sandwiches. Chives also are an ingredient of the gräddfil sauce served with the traditional herring dish served at Swedish midsummer celebrations. Chives are one of the "fines herbes" of French cuisine, which also include tarragon, chervil, and/or parsley. Close-up of a clump of chives. 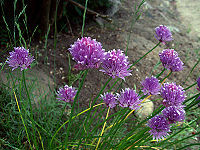 Chives are a common garden plant as an ornamental. It also has insect-repelling properties, which can be used in gardens to control pests (Kaufman et al. 1999). This later property has been long known. Retzius (1806) describes how farmers would plant chives between the rocks making up the borders of their flowerbeds, to keep the plants free from pests. Chives flowering in a bed. Albeit repulsive to insects in general, due to its sulfur compounds, chive flowers are attractive to bees, and it is sometimes kept to increase desired insect life (Baines 2000). Attracting bees can be important for gardens with an abundance of plants in need of pollination. Chives have been used traditionally as a medicinal herb. The Romans believed chives could relieve the pain from sunburn or a sore throat. 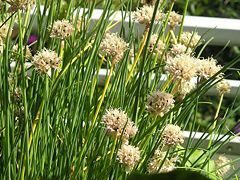 It further was believed that bunches of dried chives hung around a house would ward off disease and evil (Gilbert 2006). Just as the growing plant repels unwanted insect life, the juice of the leaves can be used for its insect repellent properties, as as well as fighting fungal infections, mildew, and scab (Holtom and Hylton 1979; Riotte 1978; Huxley 1992). The medical properties of chives are similar to those of garlic, but weaker; the faint effects in comparison with garlic are probably the main reason for its limited use as a medicinal herb. Containing numerous organisulplide compounds such as allyl sulfides (Burdock 1996) and alkyl sulfoxides, chives have a beneficial effect on the circulatory system, acting upon it by lowering the blood pressure (Craig 2004). As chives are usually served in small amounts and never as the main dish, negative effects are rarely encountered, although digestive problems may occur following over-consumption (Craig 2004). Baines, C. 2000. How to Make a Wildlife Garden. London: Frances Lincoln. ISBN 0711217114. Burdock, G. A. 1996. ''Encyclopedia of Food & Color Additives. Boco Raton: CRC Press. ISBN 0849394120. Craig, W. J. 2004. Talking chive: Color your plate while battling bugs. Vibrant Life. Retrieved April 6, 2007. Gilbert, L. 2006. Chives. Sally's Place. Retrieved April 6, 2008. Holtom, J., and W. Hylton. 1979. Complete Guide to Herbs. Rodale Press. ISBN 0878572627. Huxley, A. 1992. The New RHS Dictionary of Gardening. MacMillan Press. ISBN 0333474945. Kaufman, P. B., T. J. Carlson, B. Kaufman, H. L. Brielmann, S. Warber, L. J. Cseke, and J. A. Duke. 1999. Natural Products from Plants. Boca Raton: CRC Press. ISBN 084933134X. Kemper Center for Home Gardening. 2006. Allium schoenoprasum factsheet. Missouri Botanical Garden. Retrieved April 6, 2008. LaFray, J. 1987. Tropic Cooking: The New Cuisine from Florida and the Islands of the Caribbean. Oakland, CA: Ten Speed Press. ISBN 0898152348. McGary, M. J. 2001. Bulbs of North America: North American Rock Garden Society. Portland, OR: Timber Press. ISBN 088192511X. Naturhistoriska Riksmuseet. 1997. Gräslök. Den Virtuella Floran. Retrieved June 13, 2006. Retzius, A. J. 1806. Försök til en Flora Oeconomica Sveciæ. Sweden: Lund. Riotte, L. 1978. Companion Planting for Successful Gardening. Vermont: Garden Way. ISBN 0882660640. Trowbridge Filippone, P. 2006. Chives. About.com: Homecooking. Retrieved April 8, 2008. This page was last modified on 21 August 2008, at 18:43.